This is the last (I think!) of my Harvest Festival photos. 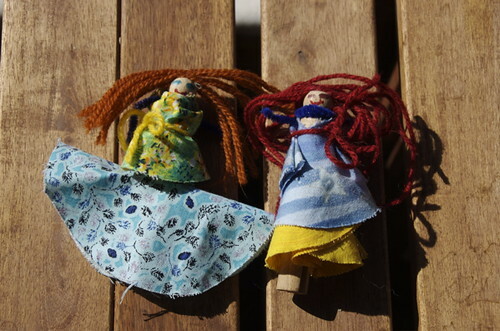 These little darlings were made with clothes-pins (duh), and scraps of fabric and yarn. The skirts are simply circles with holes cut out the middle so they can easily be slipped on the clothes-pins. Hello -just found you through loobylu. Spent a lovely hour or so reading through some of the wonderful things you do with your children. So inspiring…merci beaucoup!! !